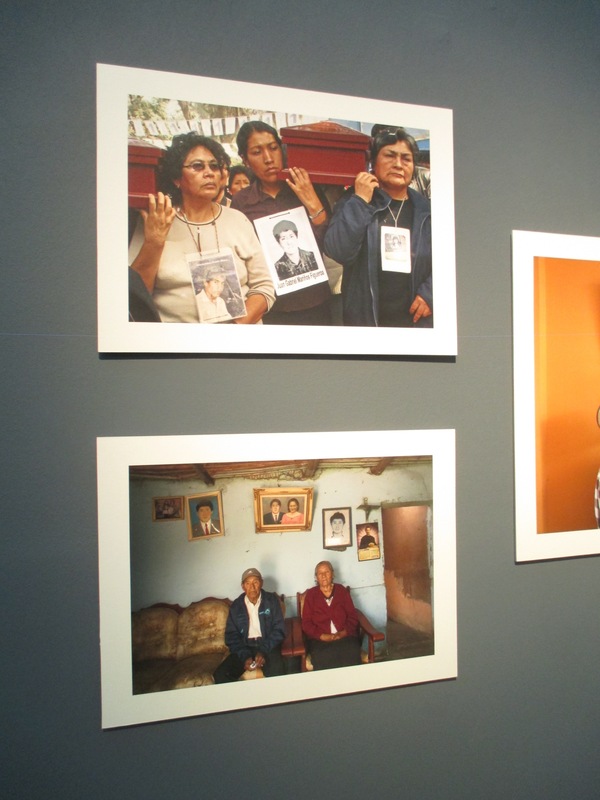 When I read about a new photography exhibition at the Parque de la Memoria I decided it was the right time for me to return to this moving place I discovered accidentally when I took the wrong bus in 2014. 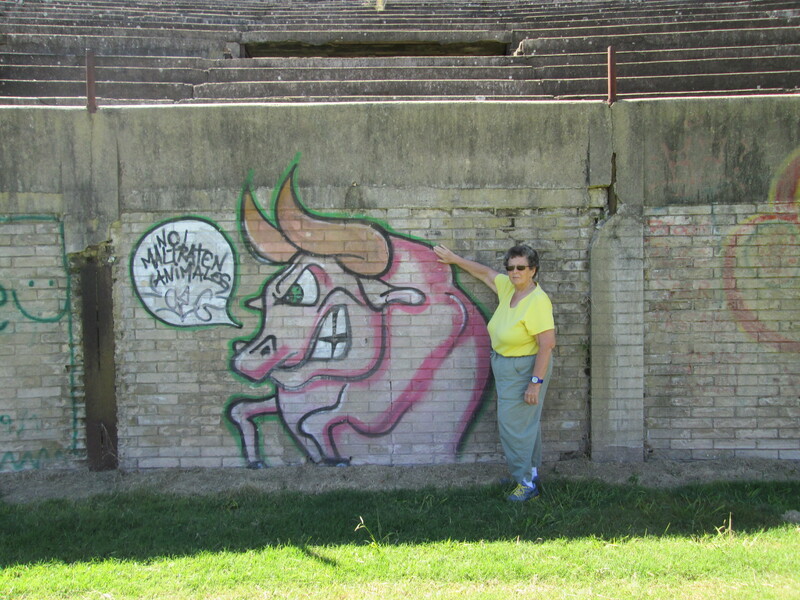 My second visit there the other day confirmed this important place for locals and tourists alike to visit. It is far from the city center, but close to the heart. I hope you will experience some of its power through the art highlighted in this post. 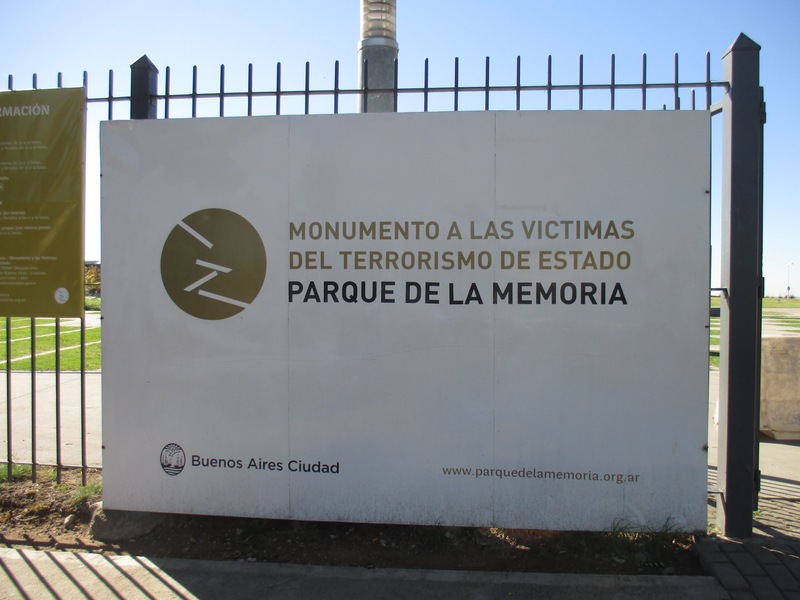 The Parque de la Memoria (http://parquedelamemoria.org.ar/), in Spanish “El Monumento a las Víctimas del Terrorismo de Estado” a Monument to the Victims of State Terrorism) is a 14-acre sculpture park in Buenos Aires located near Costanera Norte, close to the City University, and adjacent to the Río de La Plata River. 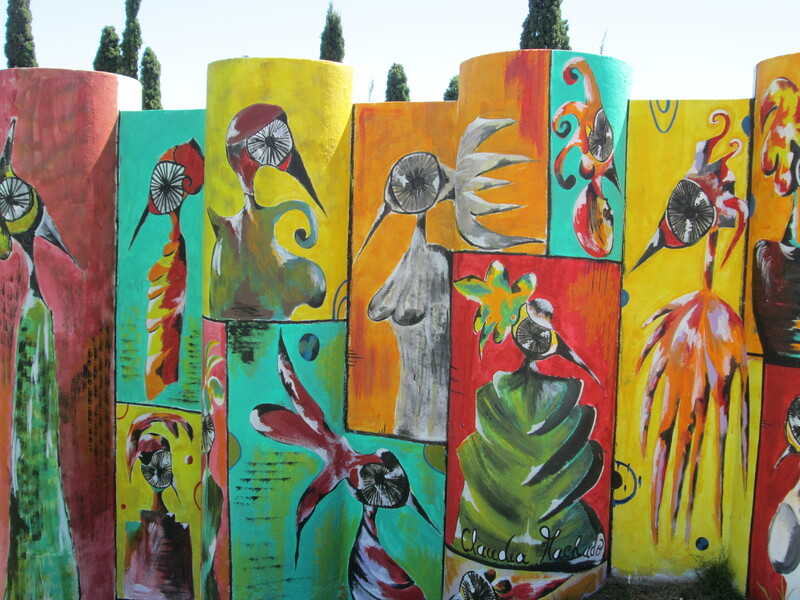 The park was completed in the early 1990’s as a reminder of the brutality of the dictatorships that were in power in Argentina and throughout Latin America during the 1970’s and 1980’s. A three-sectioned monument records the names and ages of everyone who disappeared during the period 1969 -1983. 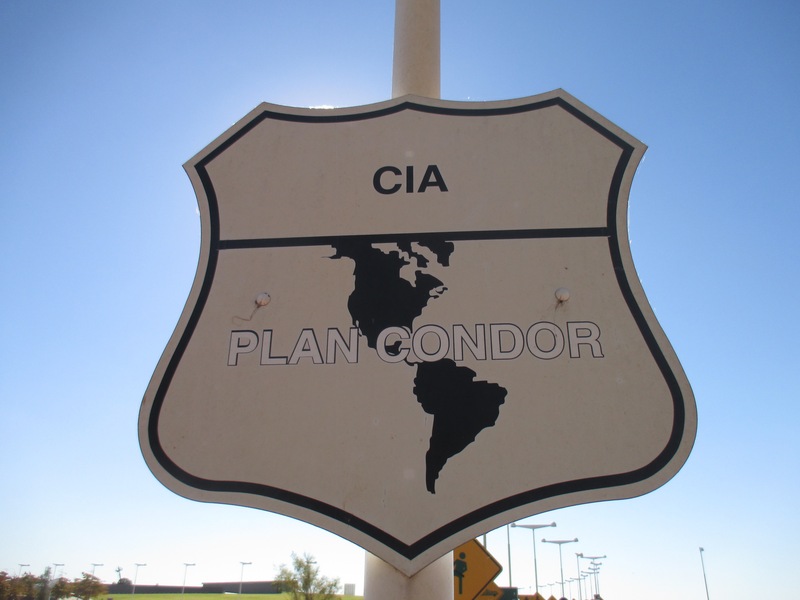 It is a site with sinister associations. Its proximity to the University of Buenos Aires is pertinent because many of the victims were of student age, and it is next to the Rio de la Plata, where many bodies ended up. 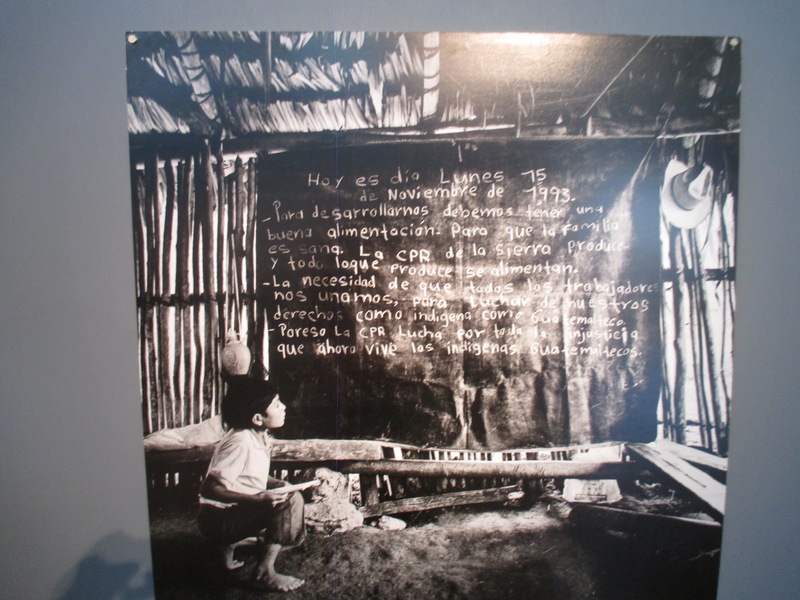 The junta’s notorious “death flights” (vuelos de los muertos) would take off from a military airport right next to the park, and the prisoners would be thrown into the muddy waters below. From heights that killed them on impact (to learn more read The Story of the Night by Colm Toíbin). 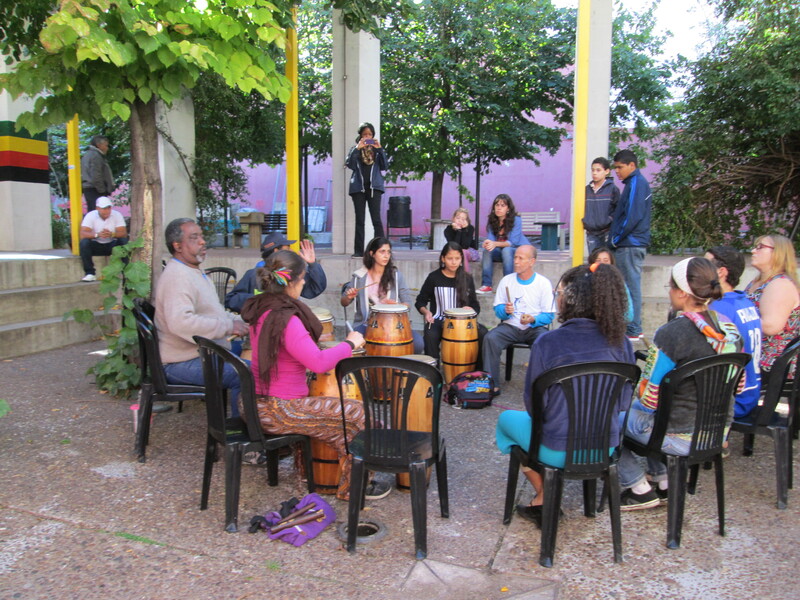 The park project was a collaboration among human rights organizations, the University of Buenos Aires and the Executive and Legislative Powers of the city. Since my initial visit, the park now also houses the Monumento a las Víctimas del Terrorismo de Estado, a public art program and the PAyS Room. The PAyS Room – acronym for the slogan in Spanish: “Presentes, Ahora y Siempre” (“Present, Now and Forever”) –“ is a space for debate and reflection about State terrorism, human rights and the construction of a collective memory through art, investigation and educational activities.” It is also a venue for visual arts exhibitions, seminars, conferences, workshops, and other activities of general interest that aim for a critical thinking about State terrorism and the persistent scars it has inflicted on Argentine society. Scattered throughout the park a number of sculptures add powerful witness to the fate of more than 30,000 people during the 1976-83 military dictatorship in Argentina. 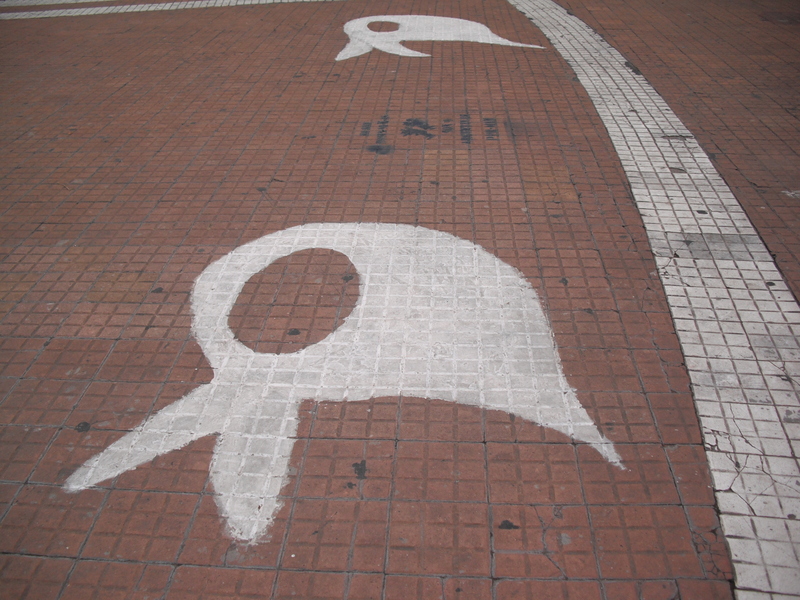 One art piece I found to be amazingly powerful and educational was the installation Carteles de la memoria” (Memory Signs by Grupo de arte callejero), a series of 53 life-size traffic signs camouflaged to suggest a route through Argentina’s recent history. 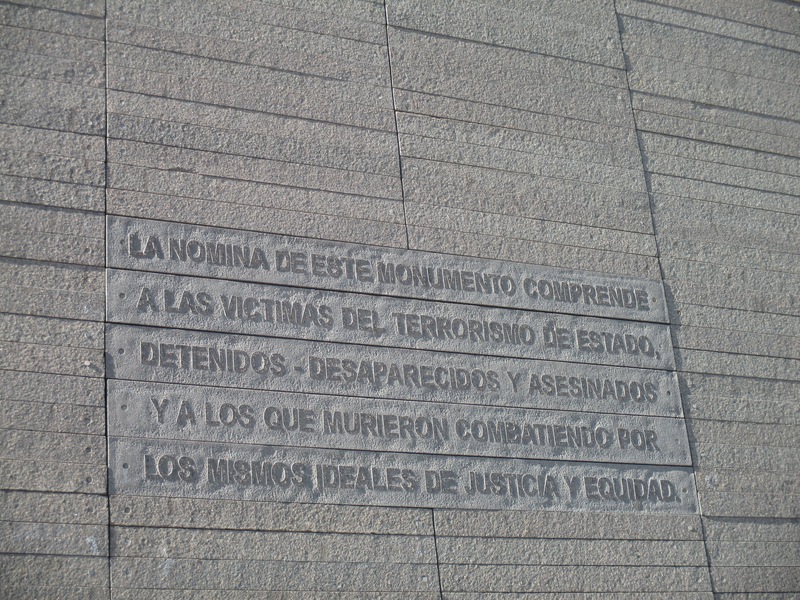 Each sign has text accompanying it that explains in brief yet meaningful critical commentary, how state terrorism developed in Argentina. Though only a few are reproduced here, the full 53-sign series is an enormous history lesson to absorb. 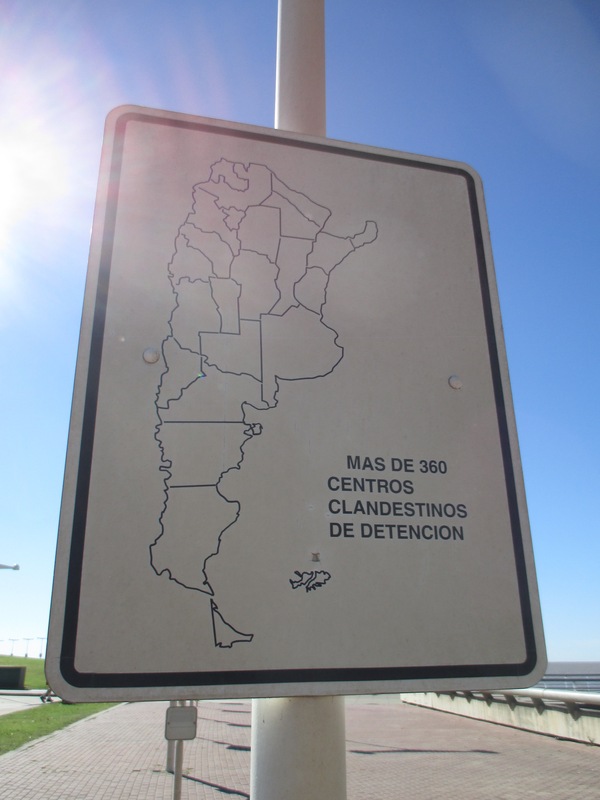 showing the map of Argentina’s provinces where clandestine detention centers stood. More than 360 clandestine detention centers existed although official authorities denied their existence and the destinies of those detained and tortured there. 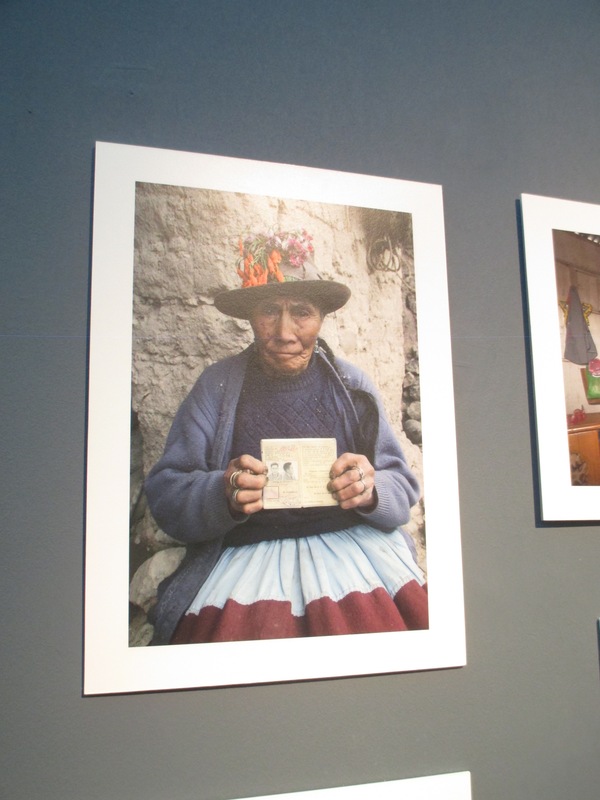 On display in the PAYs Room was an equally powerful and moving contemporary photography exhibition, “Huellas de lo Real” (“Footprints of reality”), featuring the work of Juan Travnik, an Argentine who captures urban experience postdictatorship and Jonathan Moller, an American documentalist and human rights activist, whose work gives voice to the struggles of peasant populations during conflicts in Peru, Guatemala, El Salvador and Nicaragua. 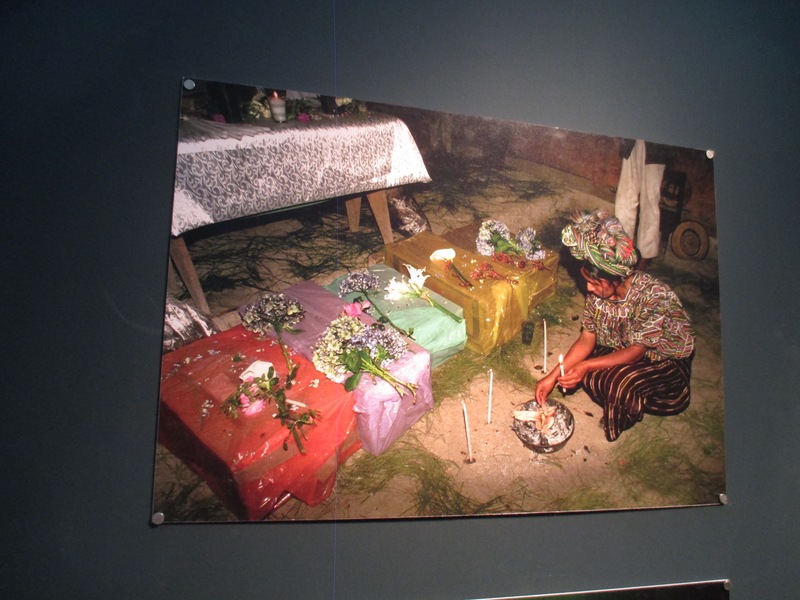 The temporary exhibit brought the peasants’ faces and lives into the very center of this memorial space. Another outdoor sculpture of a text cut into steel forms Maria Orensanz’s sculpture “Pensar es un hecho revolutionario.” (To think is a revolutionary act). 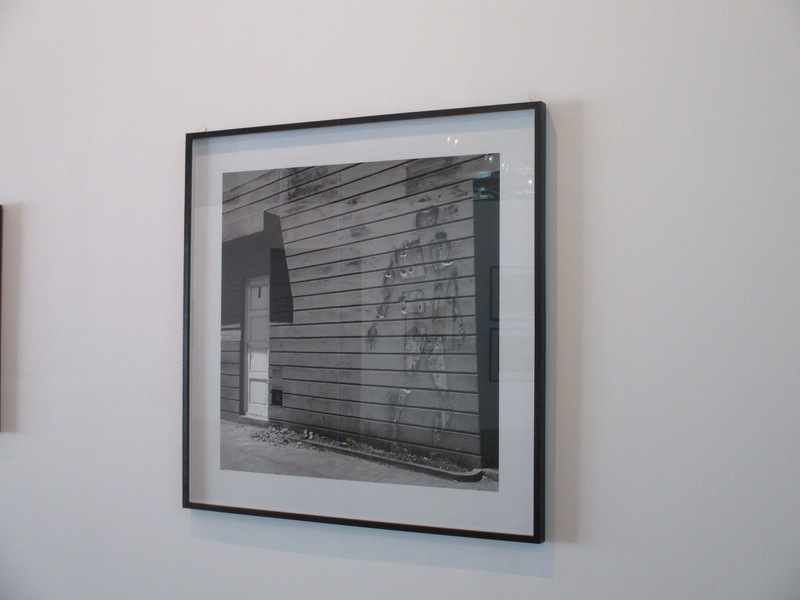 The text has been installed in such a way that the viewer composes the text in his or her mind. The piece alludes to the power of reflection and refers indirectly to the censorship of books and free thought. 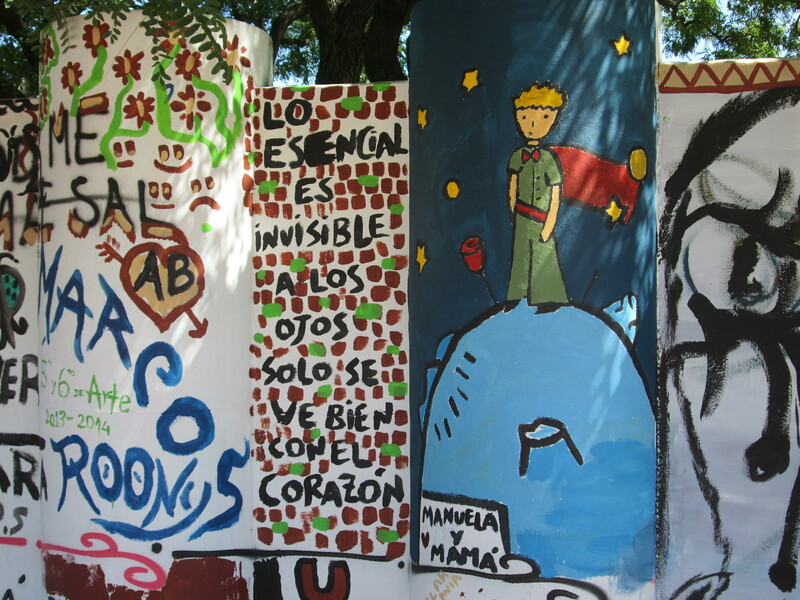 Whether you are inside the PAYS room with its exhibits, walking the outdoor open space of the park along the Rio de la Plata, searching through the names honored in the monument, or viewing the sculptures and thinking and learning about the disappeared, a visit to the Parque de la Memoria in Buenos Aires is a special place–a space for reflection and remembrance. Worth the trip! 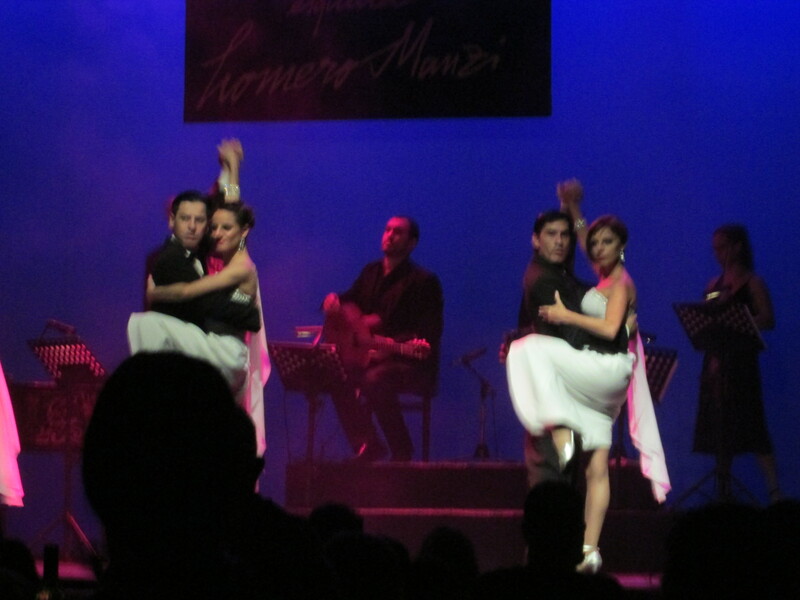 music, tango in the theatre and in the neighborhood. The weather: late summer, early fall, with daytime highs in the low to mid 70’s, except for one day with afternoon and overnight rain. Sunny, blue skies with low humidity, a plus for visiting Buenos Aires late summer to early fall. Having a travel-conscious traveler like Kathy here was wonderful as she continually gave me feedback about those events she thought were “must-do’s” for all my tour guests. 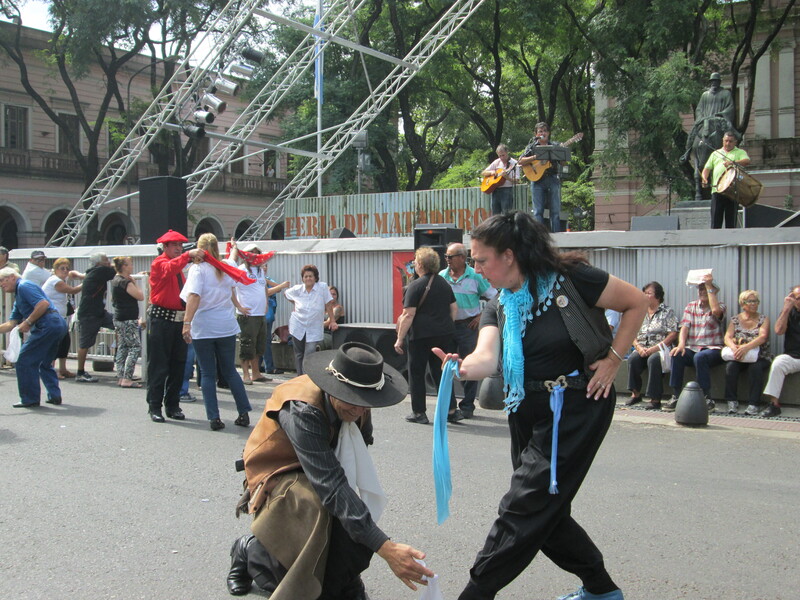 Visiting the Feria de Mataderos was one of those. On Sundays from March through December, there are two adjacent arts and crafts fairs, one in the park of Nueva Chicago (no kidding, that’s really the name of the place) and the other in the Feria de Mataderos itself, where the culture of Northern Argentina shapes the arts and crafts, foods, music, lots of dancing, singing, and a gaucho skill riding “sortija” competition on display. Our lunch consisted of a “choripan” (what we know as a sausage sandwich on good French bread) cooked on the parrilla (barbecue grill), accompanied by your beverage of choice and papas frítas (French fries) for less than $8 per person. 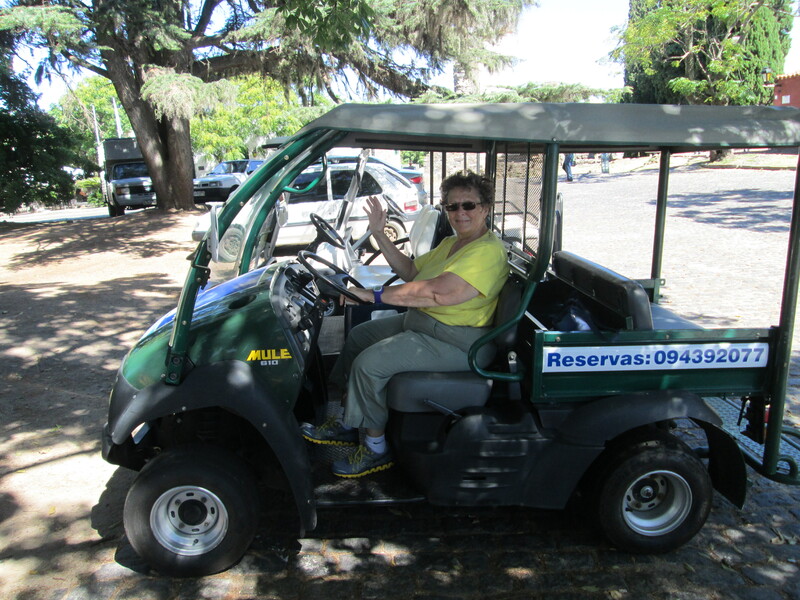 Another of Kathy’s “musts” was to rent a vehicle to tour Colonia in style. And so we did! 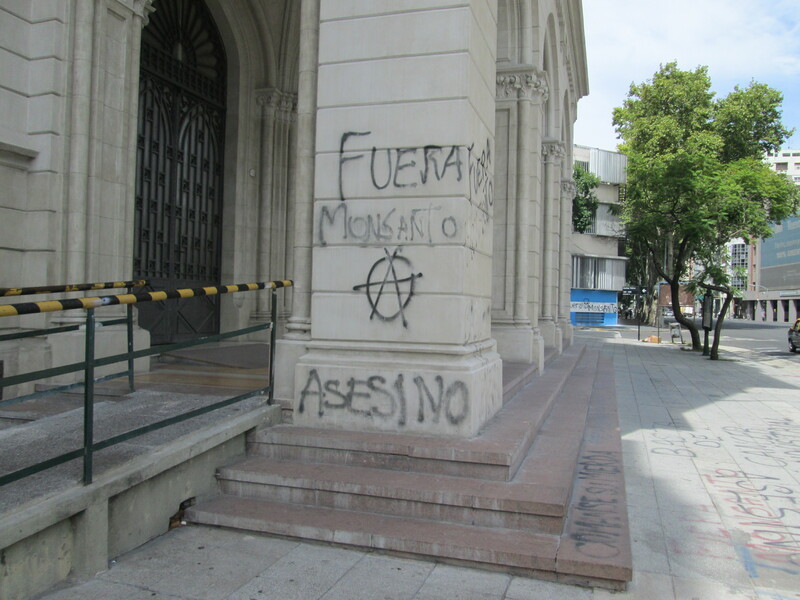 on the column of a newly restored historic building in San Telmo where protesters spray painted their message to Monsanto and passers-by like we were one Sunday morning. Two of the more moving political moments we shared during Kathy’s visit took place one afternoon at the Plaza de Mayo. There we witnessed the silent procession of the Mothers and Grandmothers of the Disappeared, who have met and walked here every Thursday afternoon for the past 37 years, beginning as a new form of social protest during the Dirty War (1976-83) and continuing through today. Sharing the plaza that Thursday was an exhibit created by the 9th Conference of Women Bank Workers to protest discrimination against women. 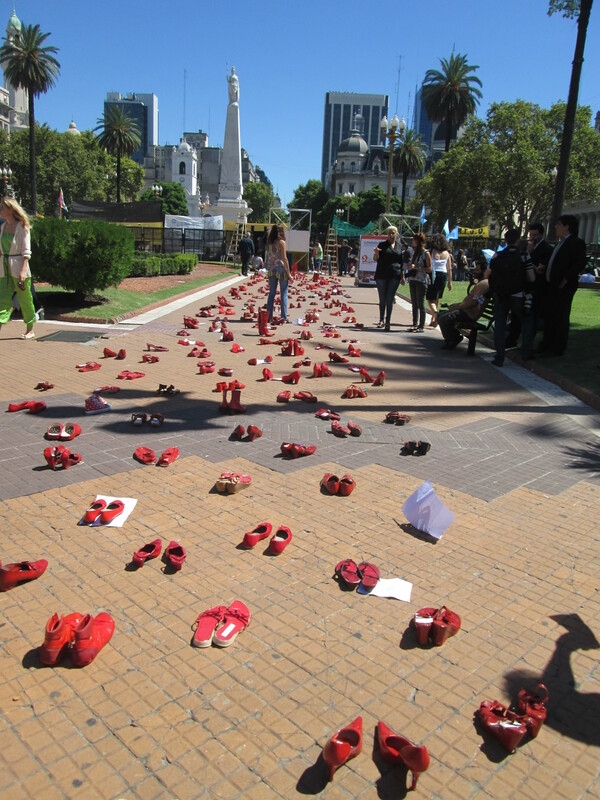 alongside the pairs of bright red women’s shoes standing in silent contemporary witness against violence to women was moving. 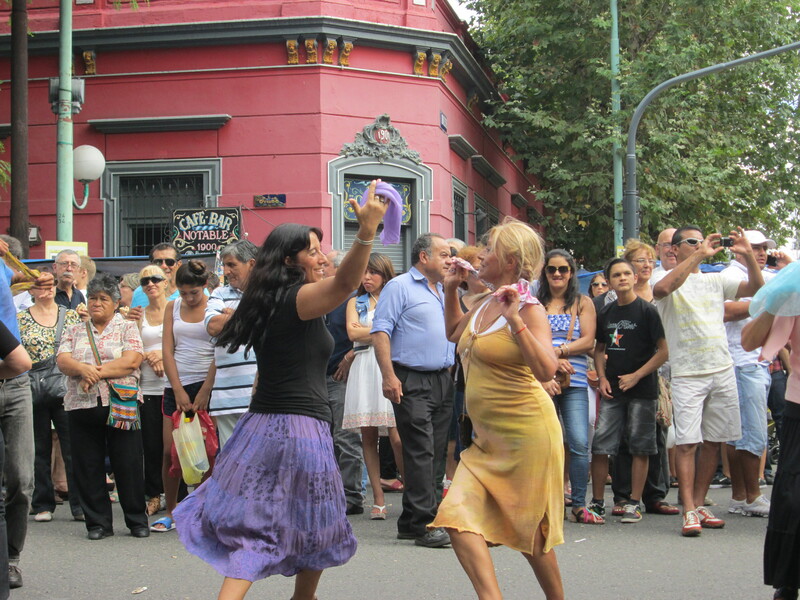 These two diverse groups of Argentinian women will take the stage in my next post. Great weather formed the background for our March touring, and except for one rainy afternoon and evening, we enjoyed sunshine and temperatures from 70-80 degrees, the usual early March fare here. In other words—an ideal time to visit for those north Americans who don’t want summer’s heat but do want to escape the brutal winters in the Midwest and beyond. just a few blocks away from my apartment, and the art deco and art Nuevo on the streets and in the cafés, well, it’s quite something to experience. Come see for yourself. 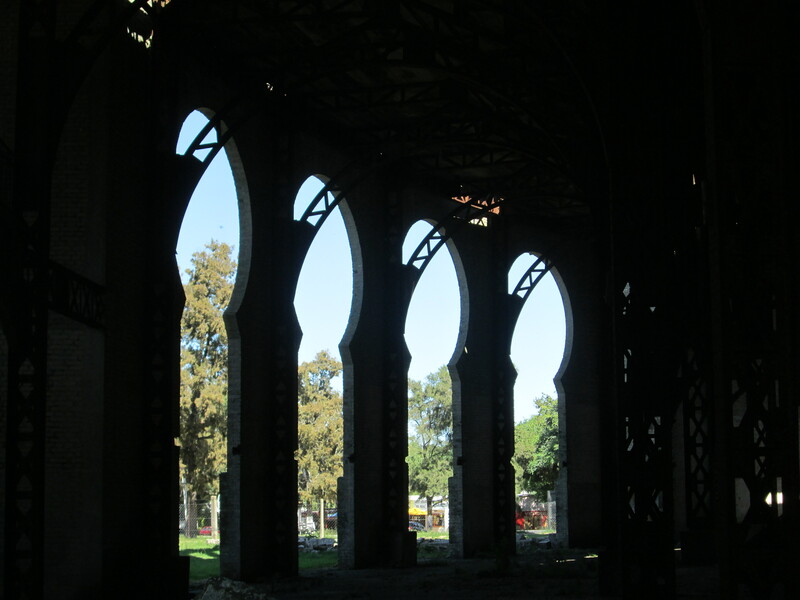 I’m accepting reservations now on a limited basis for my personalized tours of Buenos Aires and beyond in 2015 (January through June). Don’t wait too long to visit the Paris of South America! I’ll show you a good time, no doubt. Want to gain 4 hrs of daylight and 70-80 degrees? 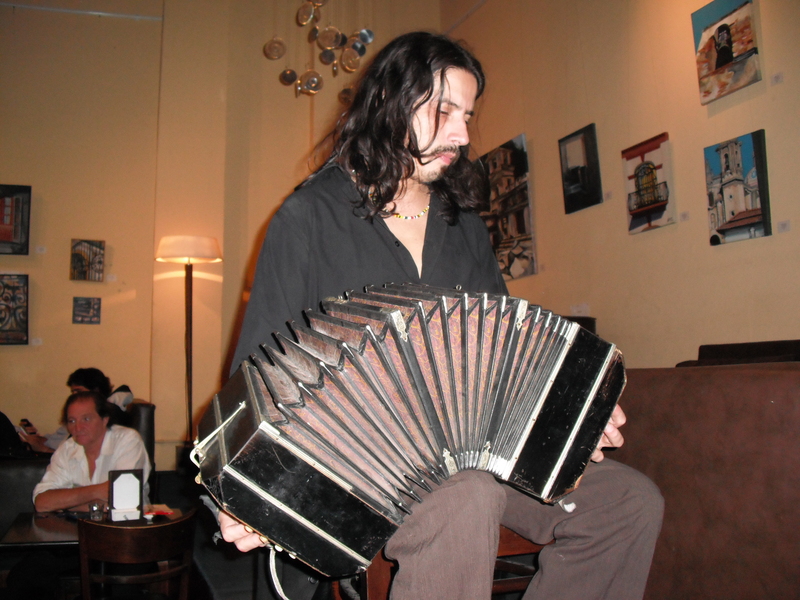 Come let me guide your visit to Buenos Aires in 2014. I can’t think of a better winter getaway than to fly down to summer for awhile. Let the cold and snow melt away to long, sunny days and enchanted evenings as you enjoy the culture, food, sights and people of this South American wonderland. 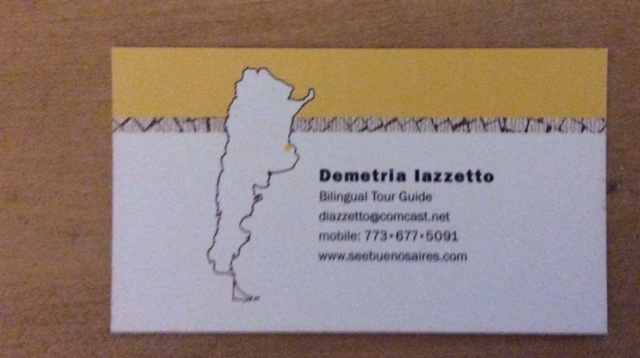 Let me help you plan your visit, or even become your personal BA tour guide and translator. You can see, listen to and learn to dance tango, visit the city’s many art museums, shop for silver, leather, designer clothing, wine and more in the boutiques, elegant shopping malls, or the local San Telmo antiques street fair. 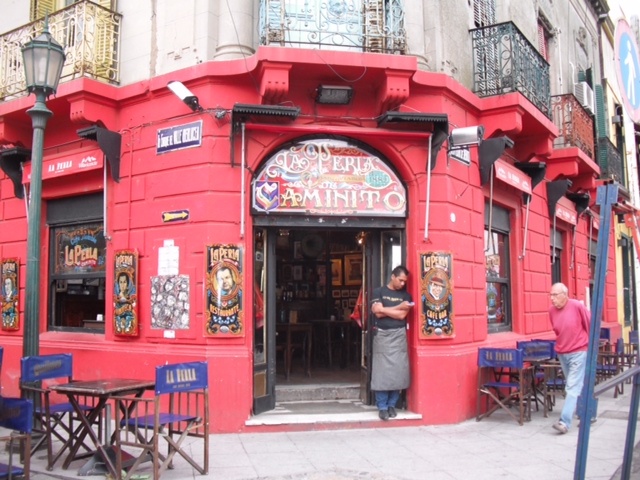 Sample delicious Argentine cuisine–empanadas, wines, parrilla (barbecue), artesanal pastas, pizzas, gelatos. 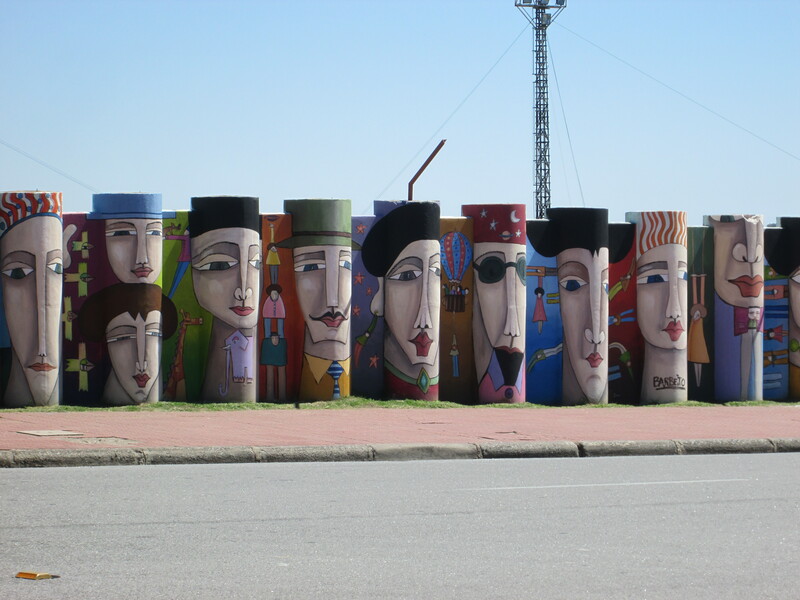 Walk the neighborhoods of Recoleta, Palermo, Barrio Norte, La Boca, Puerto Madero, and more. Ride the train to Tigre, the delta and have lunch as you cruise the channel between Argentina and Uruguay, learning about the ecology of this unique environment with guides who navigate the channels and know all the spots to see. 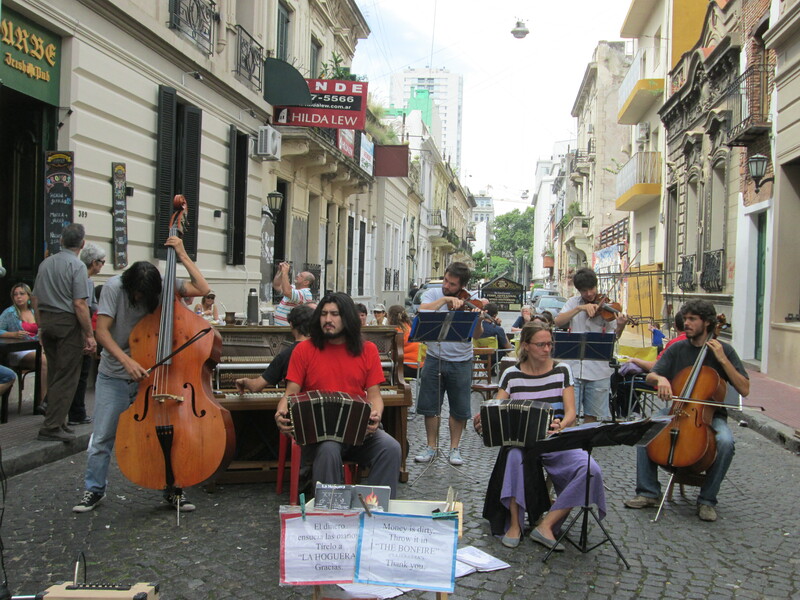 Summer weekends bring everyone to the artesan´s ferias in Recoleta and San Telmo, and local murgas and marches with drummers and dancers in costumes winding through the streets of San Telmo and La Boca. 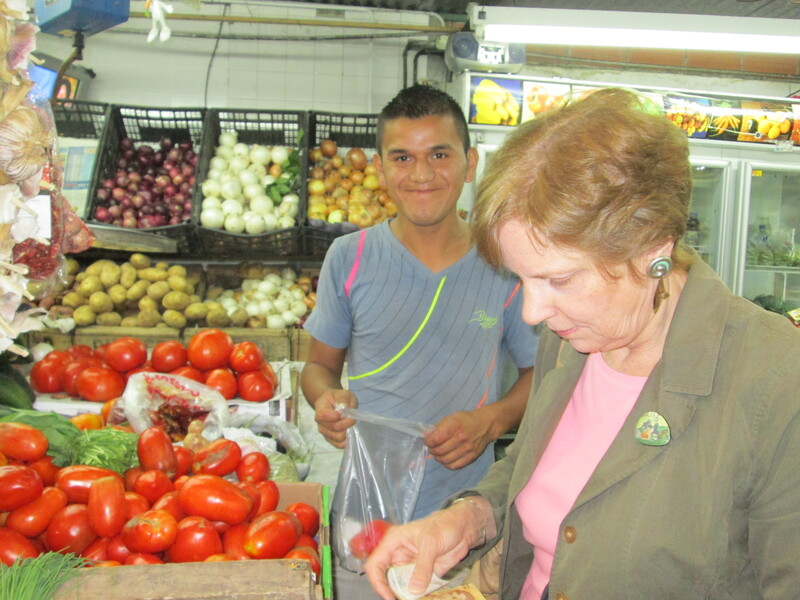 I can help make your reservations, be your translator, and take you every place you want to see, including those spots where locals go to eat, drink, and spend time with friends. Interested in seeing more than BA? Iguazú Falls is a plane ride away. A 1-hr ferry boat ride can take us across the River Plate to Uruguay for a day of walking and browsing in Colonia del Sacramento, a Unesco World Heritage site. 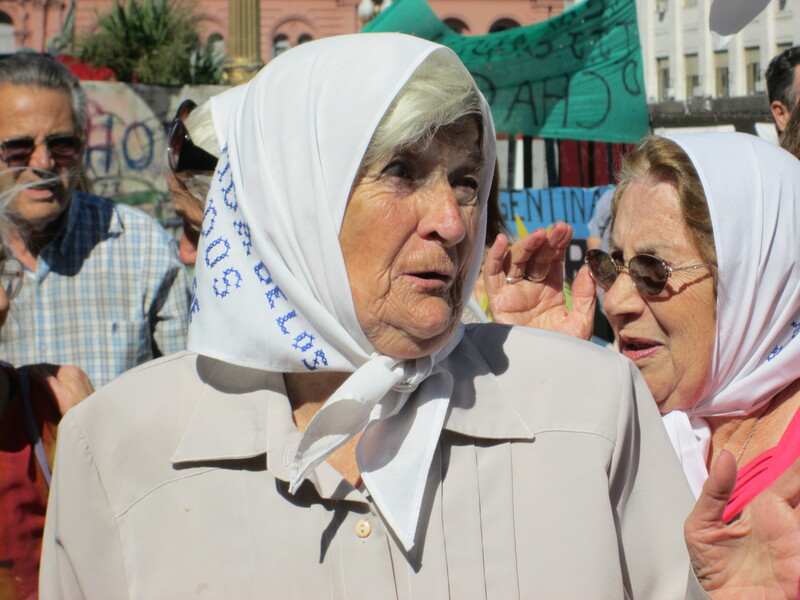 Walk in silent memory and protest with the mothers and the grandmothers of the disappeared every Thursday in the Plaza de Mayo. A day or two at a nearby estancia (ranch) will show you what the gauchos’ world is like. Wine lovers might want to fly up to the northwest wine capital, Mendoza, to sample Argentinian wines, or fly from BA to destinations throughout South America, including the wine country in Mendoza, Iguazu Falls, Bariloche in the Andes where you can ski all year round. Or head north towards the equator and tour the provinces of Salta or Jujuy. Let’s plan your 2014 dream vacation to Argentina together! 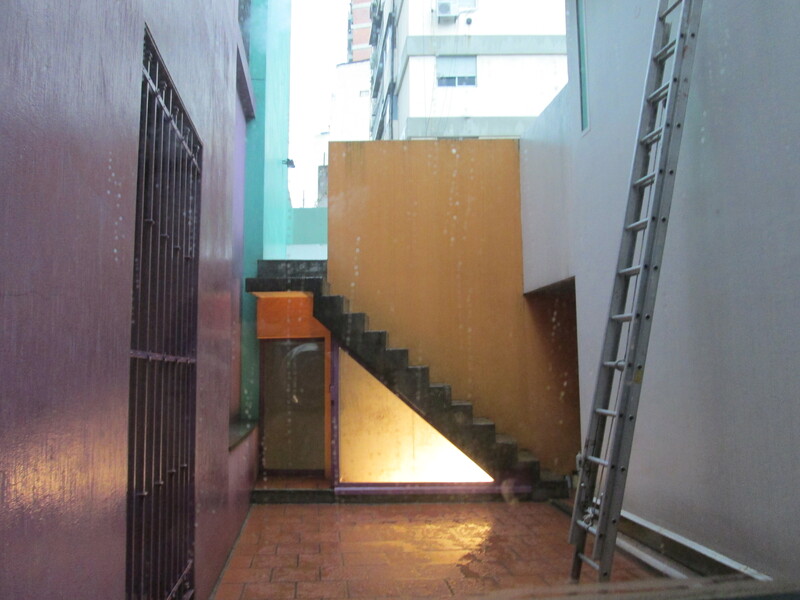 Hope to welcome you to my winter/summer home in Buenos Aires. And please spread the word. 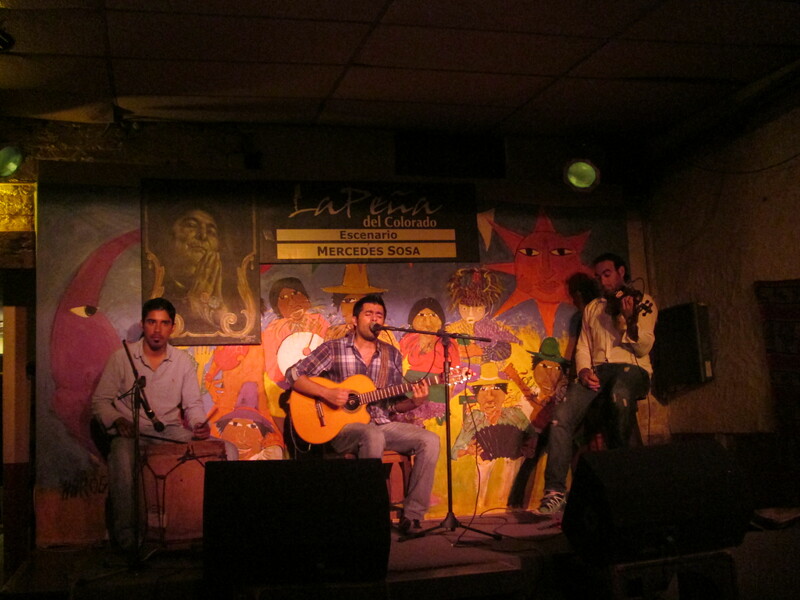 The sun sets at 8:10pm now, so lighten up your days in Buenos Aires.